"Steven Jones is the name on my phone bill, but not the one on my lease. Which is different again from the one on my electricity account. I once considered telling her all about my John Doe life, how my work makes me security-conscious with a hint of paranoia, how my real name is Jason and I'd like to kiss her on the mouth. But the moment passed." A well-paced and thoroughly enjoyable piece of Australian-noir. Lovitt has very purposefully employed the Australian vernacular and modern, like, turn of phrase to give this novel a unique voice, allowing Black Teeth to draw on the 'feel' of Jim Thompson et al. without falling into age-old American noir tropes. We have a cast of unlikeable characters led by Jason/Timothy/Steve the pre-employment investigator (you know, that guy who dredges up photos from that leather-and-lace-beer-bong incident from 2003 or your 'hidden' identity as a Twitter MRA/troll). As is always the case with noir, we find ourselves forgiving the deeply flawed moral positions of most (if not all) of the cast. What is compelling about the way this is handled in Black Teeth is that the common thread of vulnerability in our flawed friends is that each in their own way is searching for that most human of rewards: parental approval/love (I'd love to dig deeper into Gemma's story on this note and wondered a couple of times why Jason didn't look at her history more closely in general, particularly before her story developed). This search for parental validation is immediately relatable to the child in all of us, regardless of the assholery or fraudulence of the figures from whom they/we are running to or from. I'll admit that I had to flick forward when I first stumbled across the fade-out/fade-in device that marks Jason's anxiety condition, concerned that Text had had some budget-cuts in the printing department. But once I moved to a better-lit spot for reading and realised that it, like the modern, like, phrasing was purposeful, I came to respect both its use and the dedication of the typesetter at J & M who must have worked carefully to create the desired effect (yes, I always read the colophon...TYPE-NERD!). I read a great deal of crime fiction and noir. And while there is no shortage of titles being pumped out of publishing houses with more or less the same titles and covers, they are difficult forms of genre fiction to really 'nail'. It's too easy for authors to draw on the authors and traditions that they/we love (Hammett, Chandler, Thompson, Ellroy) and drop hints of atmosphere for fellow fans to read into (a damsel in distress on a dark and stormy night rescued by a flawed and alcoholic hard-nosed detective). It's also too easy for readers like me to consume lazy genre-fiction - after all, I'll happily plough through tome after tome without complaint. Even those that are excellent books in their own right can fall into this trap (I often found myself placing Cormoran Strike in Galbraith/Rowling's 'The Cuckoo's Calling' in film-noir sets from the '40s). But every now and again someone does something different with genre fiction, like Lovitt has here with noir. Not once did I find myself falling into the assumptions and movie-sets I've built in my head for noir - Jason was clearly in Melbourne, clearly in Australia (I suspect a screenwriting background puts Lovitt at a great advantage here - creating a version of Melbourne/Victoria that was just fictional enough for this nearly-Kensington and nearly-Kerang native to not be too distracted by!). Jason was in the (near) present, operating with recent technology and dealing with contemporary problems. Not once did I picture him wearing a fedora or pouring (another) single-malt into a crystal tumbler. Nor did the women in this novel need rescuing. 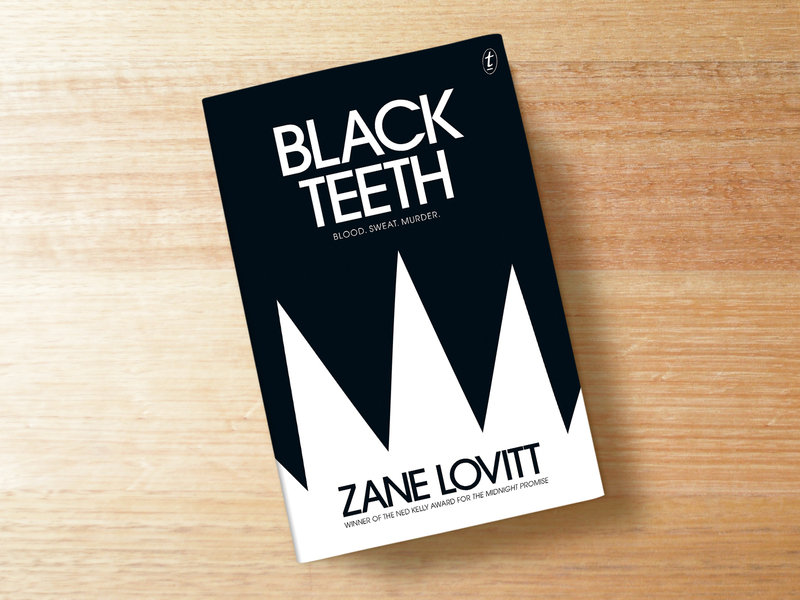 Black Teeth is the kind of Australian-noir I hadn't imagined could exist, and I'm looking forward to more like it.